I’ve been able to travel a great deal in my life, internationally, always by myself. And I travel to learn the world, and I travel to see the world and to learn about me. I’d always wanted to see Michelangelo’s “David”, which is in a museum in Florence. I went there one day, and it was shortly after a man had attacked the statue of the Pieta that was in the Vatican and had done great damage to the Virgin Mary’s face. And so there was a lot of security around the David less somebody else get that idea as well. So I went into the museum. It was packed. I’d been in there about 5 minutes when all of a sudden the security guards ran in and told us to get against the wall and not to move, which was frightening, as the David is in a small part of the museum. And the next thing I saw, workers were coming in with scaffolding. 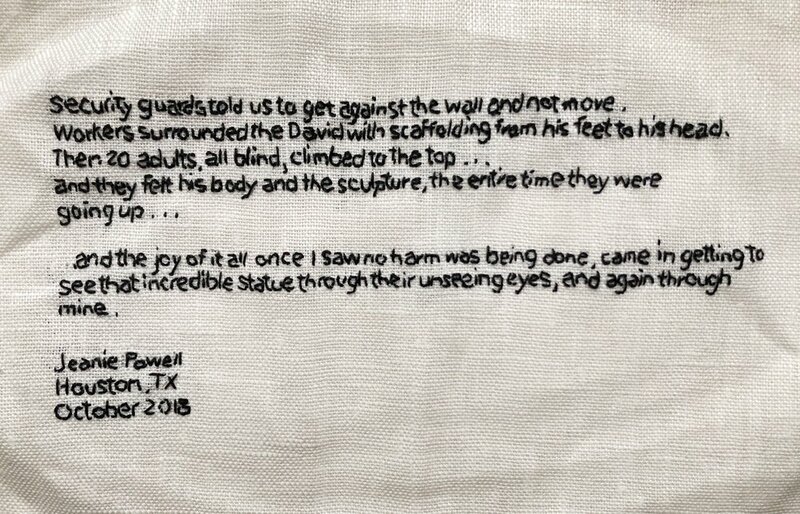 And they surrounded the David with scaffolding - it went from his feet to his head. And the next thing I saw was somewhere around 20 adults, all of whom were obviously blind.. and they let these people climb up on the scaffolding.. and climb to the top of the scaffolding to reach David’s head… and they’re feeling his body and the sculpture, the entire time they’re going up.. and the joy of it all once I saw that no harm was coming to anybody, as I got to see that incredible statue through their eyes, and through mine. And it was one of the loveliest experiences of my life.